While most are still trying to digest the latest developments in the relationship between Offset and Cardi B, Chicago rapper and previous associate Cardi King Yella has fered up yet another revelation. Whether true or not, Yella's claims having engaged in a previous relationship with Cardi B prior to her being with Offset has sparked another dispute. But, it seems that Offset isn't with the drama after Yella posted a video in which Offset can be heard exchanging some heated with him over the phone while Yella seems relatively unbothered in Las Vegas. This all began when Yella first made his comments by way his "Cardi B Truth" track, a freestyle staged over Offset's "Ric Flair Drip" track, following up with a thread Instagram posts featuring Yella and Cardi back in the day as a means taunting the the Atlanta rapper. He'd also pop out in a video on Instagram Live to further expound on his sentiments, noting that he and Cardi were caked up before the "Bodak Yellow" rapper's fame. 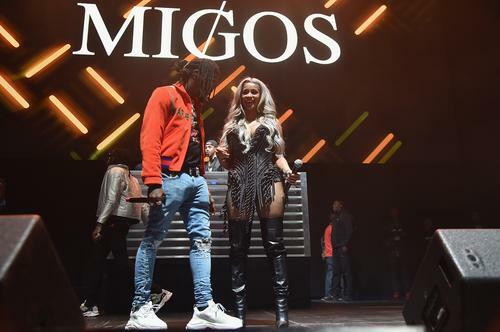 This all follows on the heels scandals plaguing the hip-hop couple's relationship following the emergence cheating allegations on Offset's end, including one woman who alleged that Offset had impregnated her. Offset and his legal team have since taken leagal action against the accuser while talk show host Maury Povich has even reached out to Cardi B and asked the rapper if she'd be interested in conducting a lie detector test. What a time.